Fluorescent Dissolved Organic Matter (FDOM) is a measure of the dissolved organic matter in freshwater and seawater. Dissolved organic matter is measured using a spectrometer when a water sample is brought back to the laboratory. This is called "colored dissolved organic matter." Colored Dissolved Organic Matter (CDOM) refers to dissolved organic matter in water that absorbs light strongly in the ultraviolet (UV) spectrum. In situ measurements of dissolved organic matter use fluorescence and measure the same pool of organic matter in a slightly different way and is a fast and easy means of tracking dissolved organic matter in natural water. Also known as "chromophoric dissolved organic matter", yellow substance, or "gelbstoff', CDOM occurs naturally in aquatic environments primarily as a result of tannins released from decaying detritus (=breakdown of plant material). When water, originating as rainfall, drains through the soil and into rivers and lakes, and ultimately into estuaries and the sea, it extracts from the soil some of the water-soluble tannic substances and these impart a yellow color to the water. 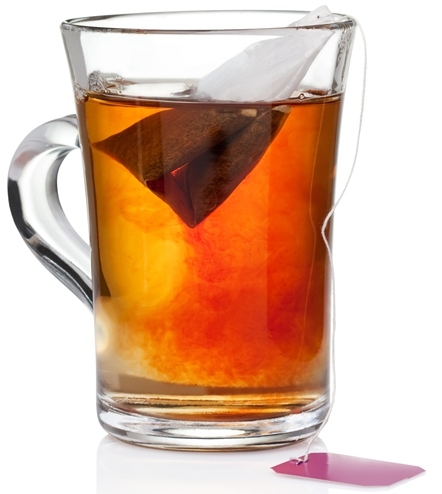 It is similar to the process used when making a cup of tea. The tea leaves turn the water a brown color just like the soil darkens the rain water runoff. 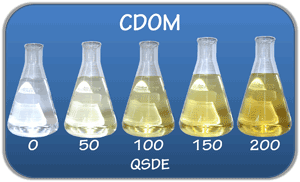 The image shows examples of different concentrations of CDOM in standardized units of QSDE (Quinine Sulfate Dihydrate Equivalent). CDOM most strongly absorbs short wavelength light ranging from blue to ultraviolet, whereas pure water absorbs the longer-wavelength red light. Therefore, non-turbid water with little or no CDOM appears blue. The color of water will range through green, yellow-green, and brown as CDOM increases. CDOM can have a significant effect on biological activity in aquatic systems. CDOM diminishes light as it penetrates water. This has a limiting effect on photosynthesis, thus reducing the amount of light that reaches seagrass beds and reduces shoot densities and the depths at which these underwater plants can grow. CDOM can inhibit the growth of phytoplankton populations, which form the basis of oceanic food chains and are a primary source of atmospheric oxygen. CDOM also interferes with the use of satellite spectrometers to remotely estimate phytoplankton population distribution. As a byproduct of photosynthesis, chlorophyll is a key indicator of phytoplankton activity. However, CDOM and chlorophyll a both absorb in the same spectral range, so it is difficult to differentiate between the two. Although variations in CDOM are primarily the result of natural processes, human activities such as logging, agriculture, effluent discharge, and wetland drainage can affect CDOM levels in fresh water and estuarine systems.